WASHINGTON (CNN) -- The alleged U.S. Holocaust Memorial Museum shooter was convicted of a similar attack on a prominent Washington landmark nearly three decades ago. 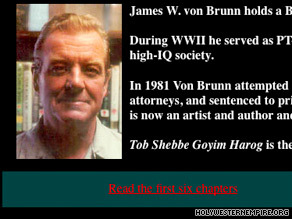 The Web site Holy Western Empire includes writings by James von Brunn and a biography. Records from District of Columbia Superior Court show James W. von Brunn was convicted of trying to kidnap members of the Federal Reserve in 1981. His court-appointed lawyer at the time told CNN that von Brunn was sentenced to 11 years in prison and served six. He was 62 at the time and lived in New Hampshire. In racist writings used at that trial, von Brunn stated, "The United States should belong to white people." The incident occurred on December 7, 1981, when von Brunn entered the Federal Reserve's Washington headquarters armed with a pistol, a shotgun, a knife and an imitation bomb. He claimed to be a photographer wanting to shoot pictures of the boardroom. Trial records show he was told to wait by security but then bolted up some stairs. He was confronted by several guards, subdued and arrested but claimed he had planted a bomb, forcing the evacuation of the building. No explosive devices were found. A satchel he was carrying contained a fake bomb. Von Brunn told officers he was upset over high interest rates and the state of the economy. The country was in a recession at the time, the first year of Ronald Reagan's presidency. After a brief trial, von Brunn was convicted on March 3, 1983, of attempted kidnapping while armed, second-degree burglary, assault with a dangerous weapon, carrying a pistol without a license and possession of a banned weapon. He was sentenced on April 21 to the minimum prison term allowed. His lack of a previous criminal record was a factor in the sentence he received. In a December 1984 appeal, his attorney, John Hogrogian asked the court to release the defendant on bail, saying his client had "renounced his actions of December 7, 1981, and expressed remorse in a letter addressed to this court." "The defendant has absolutely no plan to harm anyone or anyone's property," Hogrogian said at the time. The appeal mentions von Brunn had "a young son and aches to see him again." The trial dealt extensively with von Brunn's "attitudes about black and Jewish people," which his lawyer said was irrelevant to the charges he was facing. In his testimony, von Brunn also said, "The basic plan was to wind up where I am now," meaning in court to raise awareness of what he believed was the "treacherous and unconstitutional" acts of the Federal Reserve. A Washington city appeals court on November 12, 1985, denied his request to throw out the conviction. Records show he served the full six-years behind bars, a fact von Brunn confirms on his Web site.